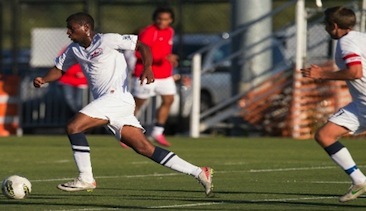 The St. Francis College Men’s Soccer team wrapped up their season last week with a 2-1 win over Quinnipiac, completing their rebound from a 5-9-3 campaign in 2010. The Terriers went 10-5-3 this season, but fell three points shy of clinching their second playoff berth in three seasons. The nucleus of St. Francis College will remain attached next year, with goalkeeper Tyler Clarhaut, midfielder Adam Maadbi and forward Gabriel Bagot all returning. Clarhaut, a junior, finished the season with a 0.82 goals against average and six shutouts in his first season as a starter. Maadbi and Bagot spearheaded the Terriers offense this season, scoring a combined 101 points this season. Both were named to the second team All-NEC squad. Bagot finished second in the conference with eight goals. No other pair of teammates in the conference combined for more points than Maadbi and Bagot. Along with Maadbi and Bagot, senior defenseman Aldo Toma was also given second team All-NEC honors. Toma, along with Robbie Weir, were both team captains this season who will not return next year after graduating. Giovatto reached a personal milestone in the win over Quinnipiac. The fifth-year head coach won his 40th career game. In his career at St. Francis College, Giovatto boasts a 40-33-16 record. His .548 career winning percentage is second only to the legendary Carlo Tramontozzi. A big factor into the team’s success this season was their ability to defend their home field. The Terriers finished the season with a 5-1-2 record at the Aviator Sports Complex. The Terriers were also tough in the second half of games, outscoring opponents 12-7. With only two seniors graduating, the Terriers are poised to have another strong season in 2012, where the team plans on going to the postseason. After seeing how well the team performed this season, it should come as no surprise to see it happen.